It takes only a few days of inadequate oral hygiene for bacterial plaque to trigger the periodontal (gum) disease gingivitis. Though sometimes subtle, there are signs to watch for like inflamed, reddened or bleeding gums. Untreated gingivitis can develop into more advanced forms of gum disease that infect deeper levels of the gums and supporting bone and ultimately cause bone and tooth loss. Fortunately, though, prompt treatment by a dentist removing plaque from teeth and gums, along with you reinstituting daily brushing and flossing, can stop gingivitis and help restore health to your gums. 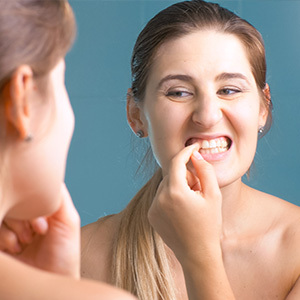 If you’re under acute stress or anxiety, however, basic gingivitis can develop into something much more serious and painful, a condition called Acute Necrotizing Ulcerative Gingivitis (ANUG). It’s also known as “trench mouth” from its common occurrence among World War I soldiers experiencing stressful periods in front line trenches without the means for proper oral hygiene. ANUG develops from a “perfect storm” of conditions: besides anxiety and deficient hygiene practices, ANUG has a high occurrence risk in people who smoke (which dries the mouth and changes the normal populations of oral bacteria) or have issues with general health or nutrition. In contrast to many cases of basic gingivitis, ANUG can produce highly noticeable symptoms. The gum tissues begin to die and become ulcerative and yellowish in appearance. This can create very bad breath and taste along with extreme gum pain. The good news is ANUG can be treated and completely reversed if caught early. In addition to plaque removal, the dentist or periodontist (a specialist in the treatment of gum disease) may prescribe antibiotics along with an antibacterial mouthrinse to reduce bacteria levels in the mouth. A person with ANUG may also need pain relief, usually with over-the-counter drugs like aspirin or ibuprofen. It’s important that you seek treatment as soon as possible if you suspect you have ANUG or any gum disease. It’s possible to lose tissue, particularly the papillae (the small triangle of tissue between teeth), which can have an adverse effect on your appearance. You can also reduce your risk by quitting smoking, addressing any stress issues, and practicing diligent, daily oral hygiene and visiting your dentist for cleanings and checkups twice a year or more if needed.